Select a template, such as the Sales invoice tracker. In the template description window, select Create. For a wider selection of templates, next to Suggested searches, select a category (such as Business, Personal, or Industry), select a template, and then select Create. For more information, see Featured Templates for Excel. Select an empty cell, such as A1, and then type text or a number. Enter the beginning of the series in two cells: such as Jan and Feb; or 2014 and 2015. Select the two cells containing the series, and then drag the fill handle across or down the cells. Use Flash Fill to automatically fill a column, such as First Name, derived from another column, such as Full Name. In the cell under First Name, type Molly and press Enter. In the next cell, type the first few letters of Garret. When the list of suggested values appears, press Return. Select Flash Fill Options to take further action. Try it! Select File > New, select Take a tour, and then select the Fill Tab. Save a workbook to OneDrive for Business or OneDrive (personal) to access the workbook from different devices and share and collaborate with others. – choose OneDrive – <Company name>. 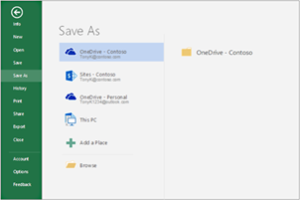 – To save to OneDrive (personal), choose OneDrive – Personal. Enter a name for the file, and then choose Save. You may need to sign in to your work or school account, or your Microsoft account. For more information, see Save your workbook. Select the cell below the numbers you want to add. Select Home > AutoSum (in the Editing group). In the selected cell, press Return to see the results. To do other calculations, select Home, select the down arrow next to AutoSum, and then choose a calculation. Tip You can also select a range of numbers to see common calculations in the status bar. For more information, see View summary data on the status bar. Highlight important data or show data trends with the Quick Analysis tool. Select the data you want to conditionally format. Select the Quick Analysis button in the bottom-right corner of the selection. Select Formatting, hover over a conditional format, such as Icon Set, and then pick the one you prefer. Try it! Select File > New, select Take a tour, and then select the Analyze Tab. Easily pick the right chart for your data with the Quick Analysis tool. Select the range of cells that contain the data you want to show in a chart. Select Charts, hover over each recommended chart, and then pick the chart you prefer, such as Stacked. Try it! Select File > New, select Take a tour, and then select the Chart Tab. For more information, see Create charts. When you have many rows, you can freeze the top row of column headings so that only the data scrolls. Make sure you have finished editing in a cell. To cancel cell editing mode, press Enter or Esc. Select View > Freeze Top Row (in the Window group). For more information, see Freeze panes. For the official article click here.